The establishment of Het Nieuwe Instituut in 2013 marked a turning point in the nation’s cultural policy. Architecture, design and digital culture are now no longer represented individually by distinct organisations (with specific programming, a delineated work terrain and their own identity). Now the emphasis is on the connections between these design disciplines. This shared interest in innovation has been an important thread through all the activities of Het Nieuwe Instituut since its formation. The fusion of the former institutes required the marriage of three distinct working cultures. Each organisation also had its own graphic identity, which remained visible in Het Nieuwe Instituut’s communications only during the period of transition. After all, in its earliest phase Het Nieuwe Instituut was responsible for implementing numerous activities that has been initiated by its forerunners. For this transition Karel Martens designed a temporary ‘mask’ that allowed the ‘old’ identities to ‘filter through’ in the institute’s website and printed matter. The ‘mask’ also contained a new layer of information in which the new approach was made visible. But this could only be a short-term measure. As the institute’s programme became more clearly outlined, the prerequisites for a new, more permanent identity were also elaborated. In creating and implementing a new graphic identity, it was important for Het Nieuwe Instituut to strike out in a new direction. An institute that represents the various design disciplines and therefore has a focus on innovation could not be satisfied with a house style based on a tried and tested model. 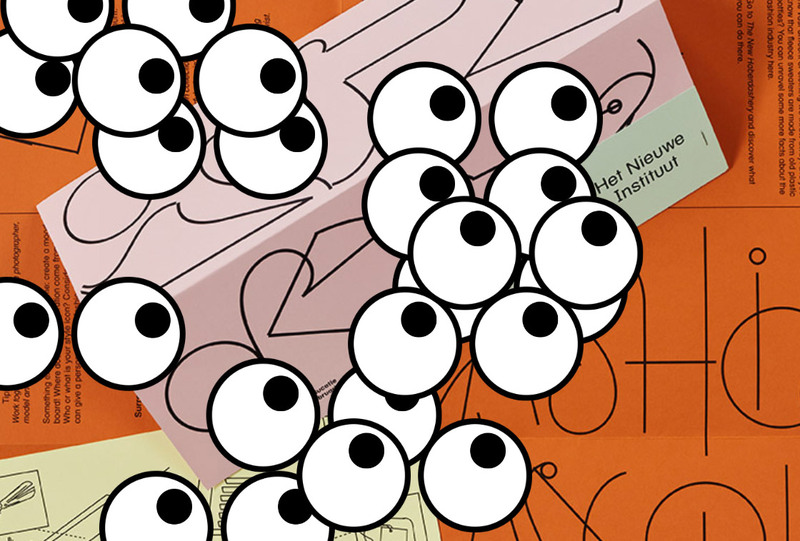 From the outset, Het Nieuwe Instituut wanted to set an example in its partnerships with designers involved in its research activities, lecture programmes, archival interpretations and design of its exhibitions, communications and house style. Furthermore, as a representative of the nation’s digital culture, the institute sought an identity that, both in terms of printed matter and its online presence, would be distinct from the prevailing trends. Historically, large corporations and cultural institutions have contributed to a rich and experimental graphic-design culture in the Netherlands, which has played an important role in establishing the reputation of Dutch design abroad. This culture is now under threat. Increasingly, even this category of clients opts for the standardisation (often euphemistically referred to as professionalisation) of communications with the result that the public’s preferences are reinforced rather than challenged. This approach leads to a shrinking of the graphic-design landscape and is disastrous for the development of young talent, which barely gets a look-in. It is part of the remit of Het Nieuwe Instituut to counter this stagnation. Accordingly, the plans for a new graphic identity quickly turned to thinking about providing a new platform for graphic designers that would simultaneously form the identity and communications for Het Nieuwe Instituut. This approach is reflected in the choice of Maureen Mooren as art director. She was asked to develop a framework within which various graphic designers could design the communications tools for Het Nieuwe Instituut. Mooren introduced the idea of a simple label that would appear as an identifying element on all graphic manifestations while allowing designers plenty of room for their own interpretations. For each project, she selects and briefs the designer(s) and, together with the institute’s project managers, supervises their output. Some projects are given to renowned designers while other are given to emerging talent. This form of talent development has proven extremely fruitful for all those concerned. The designers are given an opportunity to show their work to a broad audience and, because of the nature of the commissioning process, to excel, while the institute has been able to develop a very unique form of communications.